This entry was posted in Appetizers (Antipasti), Vegetarian and tagged Bruschetta, Cooking, Food, Italian, Recipes by ChgoJohn. Bookmark the permalink. Too funny, I thought I was the only one to set fires! I lined with parchment paper… who knew it could set on fire? I am a huge fan of blue cheese and had it served to me with a little cup of honey at a restaurant this past spring… so this recipe is definitely on my “to do” list now! PS… love the background! I’m definitely making these!! 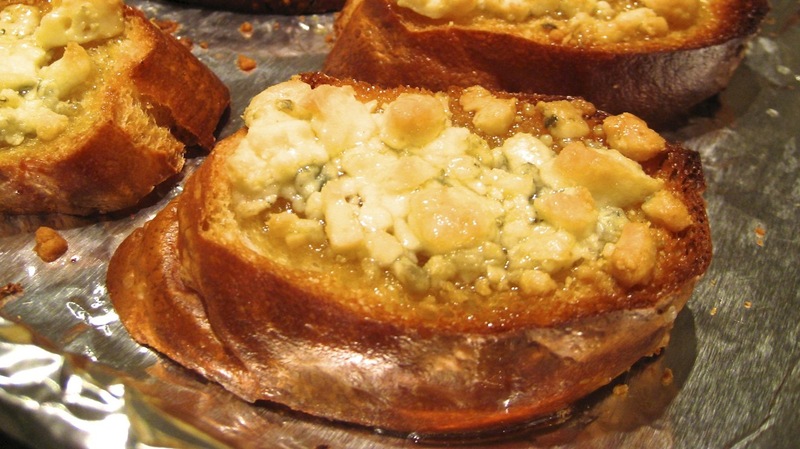 I love gorgonzola as you know and to pour on a bit of sweetness, oh my…I will be in heaven! I like the tip about toasting the bread, covering and then topping. That will come in handy for entertaining. I like the simple ingredient recipes; they always come out the best tasting! With a glass of Prosecco, the perfect appetizer! Thanks, John! I so agree, Lynda. Gorgonzola is good on its own but topping it with honey is the best! When I’m preparing a large dinner, whatever appetizers I serve have to be quick and easy. These work perfectly. I shouldn’t read your posts at work – my co-worker wanted to know what was so funny! This reminds me of the first time we had fondue with friends and Ritchey moved the burner from the table to the countertop to refill. Not thinking, he lit it then started toward the table – with fuel and fire dripping in the wake! Of course nothing was burned, but it was a spectacular sight! Debbie and Dennis still come for fondue so we didn’t scare them away, but every New Year’s Eve we always bring up the story – and Ritchey sheepishly grins! I’ll fix your bruschette tomorrow since Debbie and Dennis are coming for dinner – they will love it! Glad you enjoyed the post, Phyllis. I can so identify with Ritchie, the poor man! We all make mistakes but why must we do it before an audience? Good luck tomorrow. 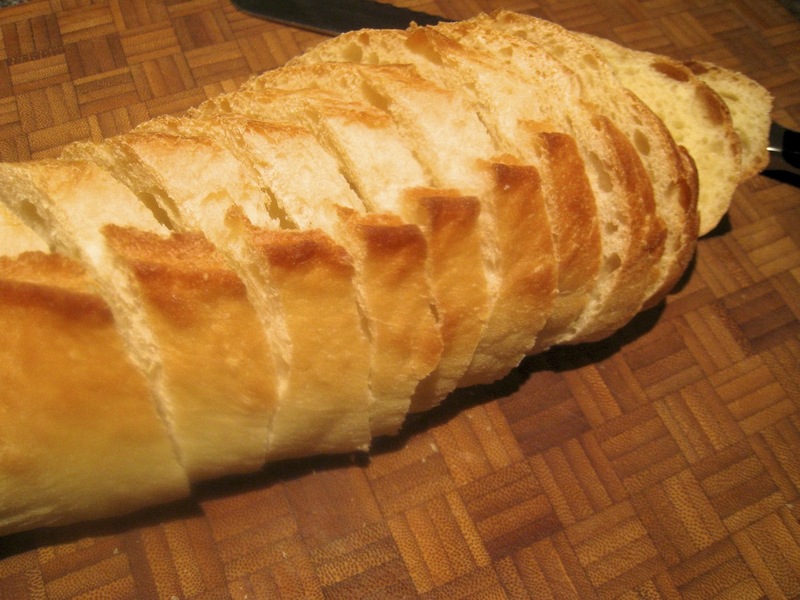 Just keep Dennis & Debbie out of the kitchen and have a spare baguette handy. You’ll do fine. Apropos to nothing, do you have 911 on speed dial? Simply yummmmmm!!! I have got to try this. And they are so easy to make! You’re gonna love ’em! I hate it when I hash something up when entertaining. I once left a pot of oil on the stove on while we were seated with 6 guests and well, it kind of caught fire! SO embarrassing! Oh, Mandy, I have had many kitchen mishaps, with plenty of them occurring before my guests. It’s one way to insure people will remember the dinner, that’s for sure! Your pot of oil catching fire, though, could have been disastrous. I’m so glad that it was only a little embarrassing and nothing worse. Enjoy your day! One Thanksgiving, a friend asked if I was a burner or cutter. He explained that cooks tend to either burn or cut themselves but rarely both. Lest there be any doubt, I am a burner. ” … steep learning curve …” Thank you for that. I’m still chuckling here over it. Spectacularly simple! And with a “try not to spit my coffee on my monitor” story to boot! Thanks for making my morning. I’ll be adding this to the holiday repertoire. These are good, David, as our friend Gail attests. That 1st Thanksgiving dinner was memorable for a number of reasons but, by far, the most memorable was my run to the trash with a tray of bruschette in flames. I laugh every time I think about it. Oh this is priceless! Baptism by fire! I would definitely opt for the oven baking option, with my luck I would set them on fire too. I’ve been known to do that a time or two with other dishes. I like the use of honey on the cheese. Warm honey. MMMmmmm! Sweet and salty. Perfect. YUM — this is our favorite bruschetta also! Try it with sliced fresh figs in season. It’s even good with sliced dried figs. Dag nabit, I wish I liked gorgonzola cheese (or blue cheese) because this looks divine! I’m sure the sweet honey pairs wonderfully with the bite of the cheese. I’m liking Gail’s idea of using figs, as well. Great appetizer! I am shocked! Shocked, I tell you! 🙂 Then we have to find you a substitute for the gorgonzola. How about ricotta salata? Pecorino romano? Asiago? I’m sure there are plenty more. Any salty cheese that you like will do nicely against the sweetness of the honey. If it has a low melting point, all the better! Oh! How about Parmesan? I agree–you could absolutely substitute another salty (and preferably stinky) cheese for the gorgonzola and do just fine. I’m with ya, Tanya. I use gorgonzola in or on everything. I, too, have burned my fair share of towels but it’s bread and the broiler that cause me the most trouble. No matter how hard I try, I seem unable to remember that there’s bread in there toasting. Mom was the same way and we would have shared a good laugh over today’s post. Toasted baguette. Gorgonzola. Honey. Skipping the flambe part, I could add a nice glass of wine or prosecco, make a meal of that and be oh so happy! A blazing appetizer had to be unforgettable to you and your guests. I think we have all had a moment like that. I can’t wait to try this! The salty goodness of the cheese and honey…yum. Yes, Karen, that appetizer flambe was unforgettable but, then again things couldn’t have gone much worse that day and we all laughed about it afterward. And, most importantly, it didn’t scare us off of this bruschetta and I’ve enjoyed it ever since. That looks great. I love to cook with gorganzola. Thanks and welcome to the blog! I, too, love gorgonzola and these appetizers, with the honey, are a great use of it. Thanks for stopping by & taking the time to comment. So I am not the only one who sets bread on fire? That being said..I love the recipe! I think the salty sweet combo will be amazing! Such a funny story, John. We’ve all had near misses in the kitchen, myself included! I live salty and sweet and your combo of Gorgonzola and honey are a real winner! Thanks John, it’s always nice to be back! Looks absolutely amazing! So perfect for fall and I love the salty and sweet pairing. Yeah, it’s all about the salty & sweet. For me, that’s about as close to perfection that you can get. This is a very good recipe. I make practically the same but with goat cheese. I’ll have to try your version with gorgonzola, it sounds delicious. Hello! If the goat cheese is salty, it will definitely work and I’m going to try it. I think the goat cheese may even melt a little better than the gorgonzola does. Thanks for the tip and you, too, have a great day! You’re making me very hungry. That sounds divine and what a perfect combination of sweet and salty and a bit of crunch. Why must we always learn the hard way in front of company. That really bites. Pun intended. Pun taken! The bruschetta flambe is only one of many mishaps that have occurred in my kitchen or dining room. I prefer to think of it as adding a little excitement to the dinner party — if not a little danger.These bruschetta, though, are definitely worth the risk. I’m making these the next time I have gorgonzola in the house. Yum! If you like the salty/sweet combination, you’re gonna love these. And they are a snap to make! o………………………m……………………g…….I’ll be making that. Why do I come look at your blog when I’m hungry?!?! 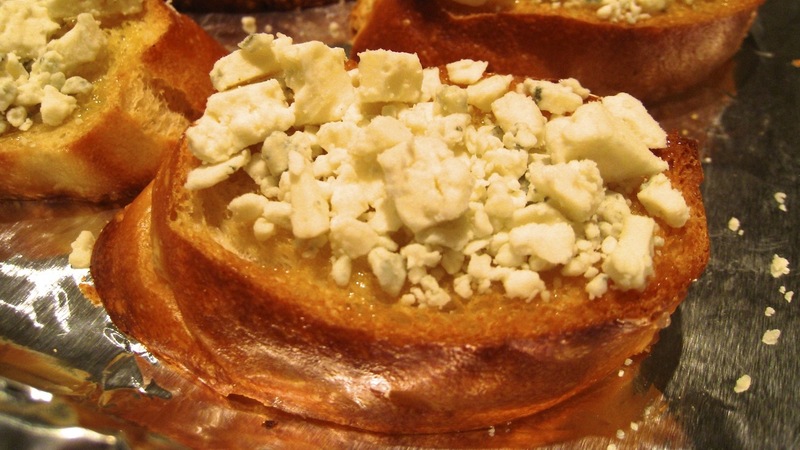 If you like gorgonzola or bleu cheese, these bruschette are for you! This looks so, so good. I sent it to my friends- well, not the one’s I will me making it for- let them find their own damn recipes! For the record I am a ‘burner.’ One Thanksgiving a pot of boiling water turned over on my thigh- that one tops all of my other mishaps. I did not blame the wine! That was some burn!!! I can’t even imagine! I hope you didn’t suffer too badly as a result. After a holiday meal, I can go over my hands and forearms and point to each burn and name the dish that caused it. Now that’s skill! These bruschetta are really good. For me, it’s all about mixing the salty with sweet. It’ll get me every time. Thank you for stopping by and taking the time to comment. And please be careful around pots of boiling water! I wish I had this 2 years ago when I started this cooking journey (that winds up in Italy more than any other place). Where the heck have I been? Yet another post showing me what I do wrong with my bruschetta! Thanks so much, John. Yeah, I can really see this becoming my own favorite bruschetta too. Fantastic!! It’s the salty & sweet combo that really makes these so tasty. If gorgonzola is a bit much for you, try making these with bleu cheese. Either way, you cannot go wrong. Thank you, Judy, for always being so complimentary. Oh I love this combination! I’m thinking we’re going to do an all Bartolini kitchen weekend! We’ll begin here! (and John, tell me what you think….one of the most amazing treats we had in France was sticks of salty Italian cheese dipped in truffle honey! It was heaven. In your mind, does a little drizzle of the truffle honey on gorgonzola’ed bruschetta sound good? Or does that fall into the category of “gilding the lily”?) Thanks for this one John! I love to serve Bruschetta at family gatherings but my Sister always complains as she doesn’t like tomatoes. So I made these last night – as I unwrapped them she exclaimed with delight “Bruschetta without tomatoes”? She loved them – everybody loved them! We now have a new “must have appetizer” at family gatherings. The honey and Gorgonzola combination is brilliant John! Love your family stories! I am so glad you liked them and thank you for coming back to tell me so. Your family’s reaction is the same that my family and guests have have had when I’ve served them. To me, it’s the mix of salty with sweet that makes them so good.